Family law encompasses a wide range of matters that have to with family relations and other domestic issues. People who are facing family law issues are often dealing with the breakdown of the primary relationship in their lives and in a time of significant transition. In other cases, parents may be facing limitations or even the complete loss of access to their children. Family law matters can a significant impact on essential aspects of your life, including your financial security and emotional well-being. As a result, it is extremely important that people facing family law issues discuss their situation with an experienced St Louis attorney as soon as they realize a dispute or issue may arise. To schedule an appointment with Kenneth P. Carp, call our office today at (636) 947-3600. Even if your issue is not on this list, Mr. Carp will be able to assist you. As a seasoned practitioner in this area, is able to quickly and efficiently evaluate a legal situation and provide effective and goal-oriented counsel and representation in all matters pertaining to family law. With so much at stake, people facing family law issues should be sure to get the best legal counsel and representation possible. Attorney Kenneth Carp has been practicing family law in St. Charles since 1991, and is dedicated to bringing his clients’ cases to the best outcome possible. As a committed advocate of resolving domestic issues, he was on the original committee that founded the domestic violence court in St. Louis County and is a court appointed Guardian ad Litem in St. Louis and St. Charles County. 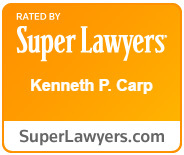 To schedule a free consultation with Kenneth Carp, call our office today at (636) 947-3600. Lincoln County: Cave, Chain of Rocks, Elsberry, Foley, Fountain N’ Lakes, Hawk Point, Moscow Mills, Old Monroe, Silex, Troy, Truxton, Whiteside, WinfieldSt. Charles County: Augusta, Cottleville, Dardenne Prairie, Flint Hill, Foristell, Josephville, Lake Saint Louis, New Melle, O’Fallon, Portage Des Sioux, Saint Charles, Saint Paul, Saint Peters, Weldon Spring, Weldon Spring Heights, Wentzville, West AltonSt. Louis County: Ballwin, Bella Villa, Bellefontaine Neighbors, Bellerive, Bel-Nor, Bel-Ridge, Berkeley, Beverly Hills, Black Jack, Breckenridge Hills, Brentwood, Bridgeton, Calverton Park, Champ, Charlack, Chesterfield, Clarkson Valley, Clayton, Cool Valley, Country Club Hills, Country Life Acres, Crestwood, Creve Coeur, Des Peres, Edmundson, Ellisville, Fenton, Ferguson, Flordell Hills, Florissant, Frontenac, Glen Echo Park, Glendale, Goodfellow Terrace, Grantwood Village,Green Park, Greendale,Hanley Hills, Hazelwood, Hillsdale, Huntleig, Jennings, Kinloch, Kirkwood, Ladue, Lakeshire, Mackenzie, Manchester, Maplewood, Marlborough, Maryland Heights, Moline Acres, Normandy, Northwoods, Norwood Court, Oakland, Olivette, Overland, Pagedale, Pasadena Hills, Pasadena Park, Pine Lawn, Richmond Heights, Riverview, Rock Hill, Saint Ann, Saint George, Shrewsbury, Spanish Lake, Sunset Hills, Sycamore Hills, Town and Country, Twin Oaks, University City, Uplands Park, Valley Park, Velda Village Hills, Vinita Park, Vinita Terrace, Warson Woods, Webster Groves, Wellston, Westwood, Wilbur Park, Wildwood, Winchester, Woodson Terrace.